Graphics & Theme: Made by: Lilianne. A-Levine.Net is in no way affiliated or partnered with Adam, Maroon 5 nor their management team. All Right Reserved. All photos in the gallery belongs to their rightful owners. Please contact us before taking any legal actions. 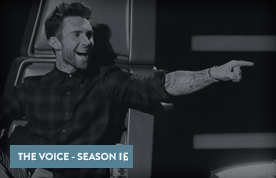 The Voice is an American reality talent show on the NBC television network. Based on the reality singing competition The Voice of Holland, the series was created by Dutch television producer John de Mol and is executive produced by Mark Burnett. Season 16 premiered on February 25, 2019, on NBC. 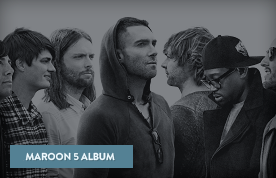 Red Pill Blues is the sixth studio album by Maroon 5. It was released on November 3, 2017, by 222 and Interscope Records. The title of the album refers to the science fiction term of taking the red pill or the blue pill, which originated from the 1999 sci-fi film The Matrix. The album is the follow-up to their fifth studio album V (2014) and features guest appearances from ASAP Rocky, SZA, LunchMoney Lewis and Julia Michaels. Maroon 5 performing at the Prudential Center on October 6, 2018 in Newark, NJ.